What do your back or neck symptoms mean? Learn which symptoms represent emergencies that need to be seen by a spine specialist immediately, and which ones can be treated with non-surgical treatment options. The good news about back and neck pain, is that the 80% of back or neck problems can improve with nonsurgical treatment options. The bad news, however, is that some back and neck pain problems can be emergency, “red flag” symptoms that need to be seen by a spine surgeon within 48 hours to prevent those symptoms from becoming permanent. Here is a list of emergency back pain and neck pain symptoms that if left untreated, can cause permanent paralysis of the related muscles and nerves. Loss of control of the bowel or bladder or retention of urine may indicate potentially dangerous damage to the spine's cauda equina nerves. The cauda equina is a bundle of nerves in the low back where the spinal cord ends. Damage to these nerves can be permanent if not treated quickly – within a day or so. This would mean that the person loses control of their bowel or bladder permanently! This problem should be seen within 24 hours by a spine surgeon. If you notice these symptoms on a weekend, to be safe, you should go to an emergency room where medical staff can assess your back injury. Weakness or numbness in a leg or arm, also points to nerve damage. Weakness and numbness is different from radiating pain into a leg, foot, arm or hand. Radiating pain can be addressed with watchful waiting, but weakness cannot. This weakness includes "foot drop," a condition in which the muscles of the leg and foot are too weak to raise the foot while attempting to walk. Again, nerve damage associated with these symptoms can be permanent if not treated immediately. This would mean the weakness or numbness in your hand or foot would become permanent. This problem should be seen within a few days by a spine specialist. Okay, that is the list of serious symptoms. Thankfully, less than 1% of people ever encounter symptom #1. Symptom #2 is more common with back and neck injury, because a disc can herniate and press on a nerve root branching off from the spinal cord. Nerve impingement in the cervical area (neck) or lumbar spine (low back) frequently occurs with disc herniation. However, nerve impingement can cause different symptoms and you need to understand when you can use watchful waiting, home remedies, drugs to mask symptoms — and when you can’t. 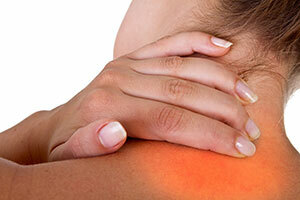 Some back pain and neck pain problems can be addressed non-surgically, and some can’t. It’s crucial to understand what treatment options to pursue, and when you need to see a spine surgeon. This is much like parking a car on a garden hose lying on the driveway. If you let the car sit too long, the hose will be permanently crimped even after you move the car. 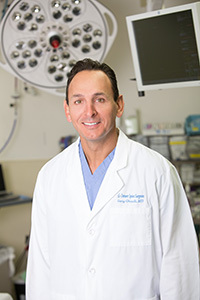 Consequently, if you are seeing a doctor and you notice WEAKNESS in a leg or foot, or WEAKNESS in an arm or hand, AND where a spinal injection has NOT provided relief of this symptom, it’s important to self refer yourself quickly to a fellowship-trained spine surgeon who does 100% spine, rather than a variety of orthopedic or neurological problems. It’s important to understand that doctors can be biased toward their particular area of training. Just as a surgeon may be biased toward surgery, a non-surgeon similarly can be biased toward non-surgical treatment options even after they fail to work for months. One of the common problems with spine care is that patients get stuck with a non-surgical treatment plan that is not working and the doctor is reluctant to refer them to the appropriate specialist who can provide relief. Ironically, while pain might seem to be a more intolerable symptom than numbness or weakness in a foot or hand, radiating pain (radicular pain or radiculopathy) can often be treated successfully without surgery, and you can try watchful waiting, for a couple months to see if non-surgical treatment options can work. With all that said about giving time to Mother Nature and non-surgical options to work, some research in the field of spine is indicating that when watchful waiting for radiating pain symptoms extends past six months, it can compromise the ultimate success of the spine surgery when it is done too late. Some researchers conclude that with spine surgery for a herniated disc, there is a window of time for the best outcome from spine surgery to treat radicular pain. If the person delays spine surgery past six months from onset of the radicular symptoms, there can be radiating pain that continues even after spine surgery. 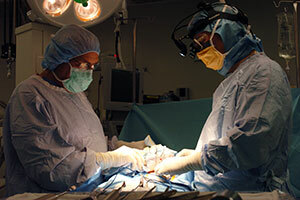 The three spine surgeons at Denver Spine Surgeons are all fellowship-trained in spine, and all do 100% spine. They refer to a network of pain management specialists who do injection therapy for patients with herniated discs. These specialists can be in the field of anesthesiology or physical medicine and rehabilitation (PMR). All of these specialists used by Denver Spine Surgeons can inject pain relieving medication into the area around the spinal nerve root to reduce inflammation and make the radiating pain or weakness symptom disappear. The way spinal injections work is much like how a ring can cut off circulation to a finger when a finger is injured and swells up. Before the injury, the ring is not a problem. But when the finger becomes inflamed, the ring interrupts circulation. When a disc herniates or bulges, it can press on a nearby nerve root causing radiating pain or weakness. When the PMR doctor or anesthesiologist injects pain medication into the spinal canal area, this can relieve inflammation around the nerve root, and the symptoms disappear. The injection therapy is not a solution in itself, because spine therapy is often needed to make the back or neck stronger, more flexible and resistant to future strain. Here is a really great back fact: 80% of the time, back and neck pain is simply the result of a muscle strain, ligament strain or soft tissue injury. Ironically, a back strain can be more excruciating than any of the above symptoms, but it can be the easiest to treat. In many of these simple cases of back or neck strain, you can improve with specialized exercises, rest, anti-inflammatory medicine and a little Mother Nature. We recommend spine therapy for patients with simple back strain or neck strain. The spine therapist will show you ways to make your back stronger and resistant to future strain, because that is the only long term cure. You can come directly to Denver Spine Surgeons and our team can coordinate your entire spine care from non-surgical treatment options to spine surgery if needed. 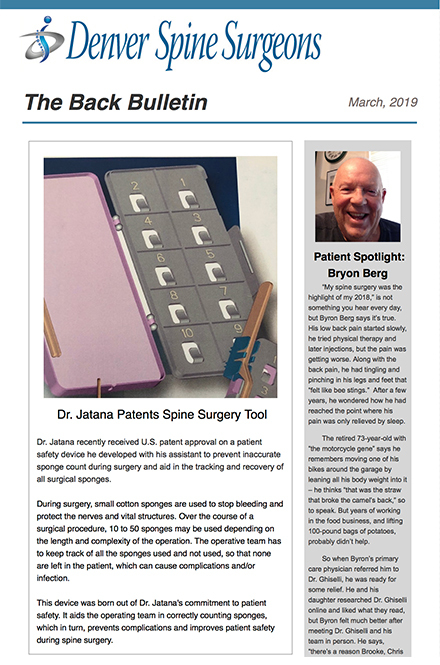 In summary, only you control the quality of the healthcare you receive by selecting the best, fellowship-trained spine doctor, and referring yourself to the right spine surgeon when nonsurgical treatment options cease to provide relief of the symptoms. There are symptoms that imply you may need to see a doctor, sometimes quickly. Briefly, here are some good rules of thumb to follow related to your back or neck. Trauma - If you fell down, were in a car accident, or did anything abrupt that may have caused an onset of back pain, definitely go to a spine specialty clinic within 24 hours. Weakness or numbness in an arm/hand or leg/foot - Any time you have numbness or weakness, call for an appointment with a fellowship-trained spine surgeon within the week. Foot drop - If you notice that your toe is dragging as you walk, this is a DANGER SIGNAL. If you delay, you could experience permanent damage to the nerves and sensation in the leg. This problem should be seen within 24 hours by a spine surgeon. Radicular pain - Any time you have back or neck pain that is radiating down into your leg or arm, especially if it is getting worse, that is a danger signal and you probably need to be evaluated by a spine specialist within a week. If you have already had injections that didn’t work, it’s time to call for an appointment with a fellowship-trained spine surgeon within the week. Persistent, chronic pain - If pain is limited to the low back or neck area does not begin to subside after several days, with some anti-inflammatories and some rest, then you probably need to be evaluated by your primary care physician. For example, if you first noticed back or neck pain on a Monday, and it's now Thursday and it's not getting better on its own, it's time to see your primary care physician to find out what is causing your problem. Anytime you have loss of control of your bowel or bladder, that is an EMERGENCY signal. You need to be seen by a spine surgeon THE SAME DAY or go to the Emergency Room. If you delay, you could suffer permanent paralysis of the nerves that control these functions, and you could become incontinent permanently.